Mrs. Charlotte Amanda Younger, 80, died Wednesday in Oakland after an illness of several months. 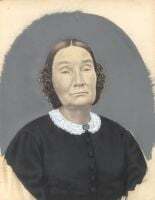 A native of San Benito county, Mrs. Younger lived here the greater part of her life. Her husband, Charles, died in 1955. Mrs. Younger, who attended local schools, left Hollister a short time ago to be near her sons in the Bay area. In her younger days, she was active as a general nurse. She was a member of the First Christian church in Hollister. Mrs. Younger is survived by two sons, Ira G. Thompson of San Francisco and Everett G. Thompson, Oakland. She leaves two sisters, Mrs. Grace Haller of Hollister and Mrs. Selma Moore of San Luis Obispo. She is also survived by five grandchildren and six great grandchildren. Services will be held Saturday at 10 a.m. at the Black-Cooper-Ottesen mortuary. Interment is in the family plot, IOOF cemetery. Hollister Free Lance, Thursday, Aug 9, 1956, Page 1, col 4. In 1900, Henry/Harry Thompson, Lottie, Ira and Everett are living in same building in the South of Market area in San Francisco as Lottie's brother Conover Austin, along with wife Bell Mullin Austin and daughter Eva. [S17] 1930 United States Federal Census, Ancestry.com, (Provo, UT, USA: The Generations Network, Inc., 2002), Online publication - Ancestry.com. 1930 United States Federal Census [database on-line]. Provo, UT, USA: MyFamily.com, Inc., 2002.Original data - United States of America, Bureau of the Census. Fifteenth Census of the United States, 1930. Washington, D.C.: National Archives and Records Administration, 1930.T626, 2,667 rolls. Hollister, San Benito, California, ED 2, roll 187, page , image 377.0. [S64] Hollister Freelance, Hollister Freelance, Oct 12, 1938:, AUSTIN -- In Hollister, California, October 11th, 1938, Anna M. Austin, beloved wife of the late George Austin; beloved mother of Mrs. Lottie Younger and Mrs. Grace A. Ebi of Hollister and Mrs. Sadie E. Ebi of Hanford; sister of Mrs. Frances Fro.